Winter Wildflowers is 12′ block which allows you to create lots of amazing projects. For example, you can use this square to make a blanket, bedspread, pillow or tote. A pattern was written for 3 colors, but feel free to use more or fewer colors! As central flowers are made as-you-go there is no additional sewing required. 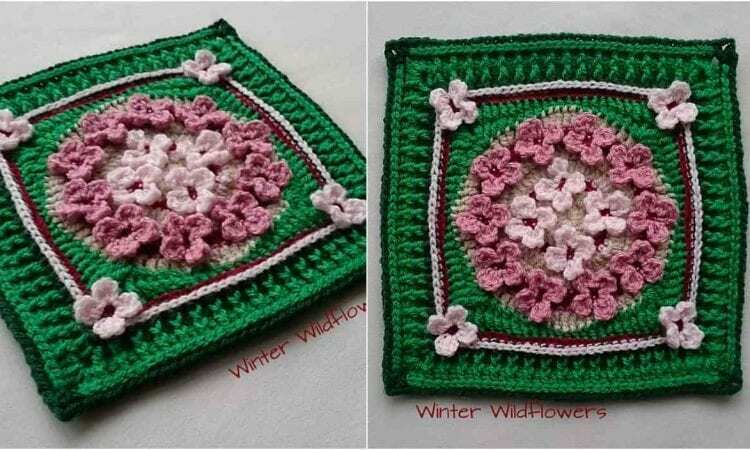 The most challenging stitch in this pattern is post stitch; thats why there are additional video tutorials which maybe helpful for the flower round 3 and 4. A link the free pattern and video tutorials are at the end of the post. More info about Hrdnglynne’s project.